For any business, celebrating a 20th Anniversary is a big deal. When they’re two businesses that reside side-by-side, that’s worth celebrating! Here in Downtown Chaska, both Fitness First and Lynn Laumann Photography on Second Street are celebrating twenty years of success, and we’re proud to have them in our community and share their stories! Decades later, Steve Ritz is celebrating the 20th Anniversary commemorating the founding of Fitness First with locations in Chaska and Excelsior. Steve earned a Bachelor of Arts degree from Gustavus Adolphus College, and a Master of Arts degree majoring in Exercise Physiology from Minnesota State University, Mankato. He is also certified through the National Strength and Conditioning Association as a Certified Strength and Conditioning Specialist. Some highlights in his career as a fitness professional include Assistant Strength and Conditioning coach for the MN Vikings and training both major and minor league players for the Cleveland Indians Organization. Steve has also had involvement in various college and high school settings including Villanova University, North Dakota State University, Gustavus Adolphus College, and Anoka High School. Steve did say yes and began training the Blake soccer player and a teammate with other athletes and adults to follow. He soon began searching for space in Downtown Chaska which lead him to Second Street, the initial home in 1998 for two years followed by a move in 2000 to the current location at 115 East Second Street. 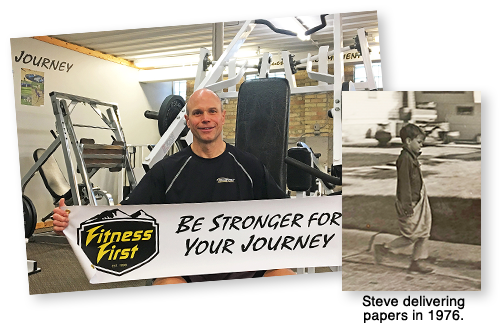 Today, with his education and combined experience in professional and collegiate athletics, Steve is leading Fitness First into the next twenty years. An appointment only strength training clinic, Fitness First combines the power of professionally educated and experienced instructors with industry leading commercial grade equipment and a scientific, evidence-based customized exercise prescription. As they share, “We commit to building genuine relationships with each client and help them to get stronger for their journey.” This means whether you’re a time-strapped professional, a competitive athlete, an active grandparent, or an adventurous mom, they will help. That was the launchpad for Lynn Laumann’s career as a professional photographer. 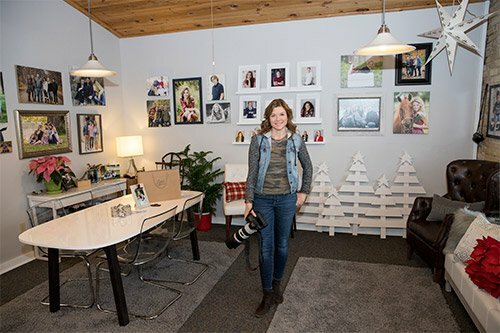 Twenty years later, Lynn Laumann Photography on Second Street in Chaska is celebrating their 20th Anniversary, and if you haven’t met Lynn, you’ve likely heard about her. Her energy is contagious, and she brings an outgoing spirit to everything she does. You’ll see her with her camera out and about during almost every Chaska event, no matter the season, and she is continually capturing the essence of our community in her work. Lynn Laumann Photography and Fitness First are two great examples of businesses that are helping make Downtown Chaska thrive! If you haven’t visited them yet, stop in and check them out. They’ll be excited to meet you! With the beauty of Autumn in full force, it only makes sense to start thinking about the upcoming Holidays! This means marking your calendars now for the 12 Days of Christmas and Hometown Holiday! The 12 Days of Christmas is an opportunity to shop, visit, save, and donate at various local Downtown Chaska businesses. We kick off the 12 Days on Black Friday with many great events at the Chaska Community Center followed by Small Business Saturday which is your opportunity to shop local and save! The 12 Days of Christmas will provide various daily opportunities to shop, save or support one of the holiday charities so check back soon for the list of events and deals. The 10th Anniversary of Hometown Holiday is scheduled for Saturday, December 3rd, with downtown Chaska businesses opening at 10:00 AM with sales, deals, and fun events for all! Santa & Mrs. Claus will arrive at City Square Park at 12 noon for pictures, wish lists, and cookies and cocoa! You won’t want to miss the Reindeer and their Sleigh arriving at 1:00 PM perfect for picture taking and a chance to meet Rudolph plus take a tour of Downtown Chaska on our Winter Sleigh Ride – all these events run until 5:00 PM when the City Square Park Christmas Trees are lit and we follow the carolers to watch the live Nativity at St John’s Lutheran Church. More businesses, deals, and events to come so stay tuned and mark your calendar for the big event! Much fun to be had this weekend with the third annual Flags and Honor of Minnesota Car & Bike show. This show at City Square Park is meant for the whole family with food, fun, entertainment and shopping! Here’s an idea of the fun to be had Saturday August 13th from 10-2. View the awesome cars and bikes. Enjoy food from Cuzzy’s, Von Hanson’s, Patron & more! Check out all the great tables and freebies from downtownchaska.com, Yellow Ribbon of Chaska, Coopers and more! Coffee available from Dunn Bros! Want a specialty coffee drink head down to 2nd street and hit up Fancy Fab for a summer sale and new fall back to school fashions, Linda’s Cellar for one of a kind finds and of course our friends at the Dunn Bros! Don’t forget all the Pokestops and Pokemons to catch while wandering the car show and all of downtown. All to benefit our Veterans! Shop ’til you drop at River City Days! Don’t miss out on the food, shopping, drinks, music and activities for the entire family! Come for the food and fun, stay for the shopping and activities at the 41st Annual River City Days! The Chaska Historical Society is presenting “Weddings of Chaska – A Historical View” on Friday and Saturday and you won’t want to miss out on the Art and Craft Fair, Sidewalk Sales or the food and entertainment every day! Saturday at 1 on 3rd/4th Street at Walnut watch the Chaska Fire Department Water Fights and stay around for Bingo and the Rotary Steak and Chicken Fry Dinner – yum! In case you haven’t had enough to eat wake up Sunday with the Pancake Breakfast followed by the Kids Parade and the RCD Car Show. Stay tuned as we reveal the great Sidewalk Sale deals! and a friendly reminder that the first clue for the Medallion Hunt will be posted this Saturday at 2:00 on the River City Days Website! Ryder Cup 19th Hole Celebration featuring 18 Holes of Chaska! The SW Metro Chamber and City of Chaska will host the 19th Hole Community Celebration at Firemen’s Park and City Square Park during the once-in-a-lifetime Ryder Cup International Golf Championship at Chaska’s own Hazeltine Golf Club September 26 – October 2, 2016! This celebration will take place after practice rounds and during/after competition rounds throughout the week. It will feature a viewing party, family fun activities, local food, wine and craft beer, live music, fireworks and much more! The Downtown Chaska Special Services District (DCSSD) is partnering with the 19th Hole Community Celebration to promote its downtown businesses and organizations with the “18 Holes of Chaska” walking scorecard and prize give-away event. The event and community celebration are FREE to attend with direct route shuttles and SW Metro Transit buses transporting people to Downtown Chaska all week! The DCSSD is seeking businesses and organizations to be “Hole” locations. Each service district business will be listed on the scorecard, but only up to 16 businesses and organizations will be highlighted as special places to visit as “Holes” (2-3 holes will be public locations). Review the attached overview and application process and submit by July 1, 2016 for consideration. If you have questions feel free to reach out to Krista Flemming at 952-288-3319 or kflemming@gmail.com.